After nearly a decade on the defensive, the world of science is about to be restored to its rightful place. But is the American public really ready for science? And is the world of science ready for the American public?Scientists wear ragged clothes, forget to comb their hair, and speak in a language that even they don’t understand. Or so people think. Most scientists don’t care how they are perceived, but in our media-dominated age, style points count. Enter Randy Olson. Fifteen years ago, Olson bid farewell to the science world and shipped off to Hollywood ready to change the world. With films like Flock of Dodos: The Evolution-Intelligent Design Circus (Tribeca ’06, Showtime) and Sizzle: A Global Warming Comedy (Outfest ’08), he has tried to bridge the cultural divide that has too often left science on the outside looking in. Now, in his first book, Olson, with a Harvard Ph.D. and formerly a tenured professor of marine biology at the University of New Hampshire, recounts the lessons from his own hilarious-and at times humiliating-evolution from science professor to Hollywood filmmaker. 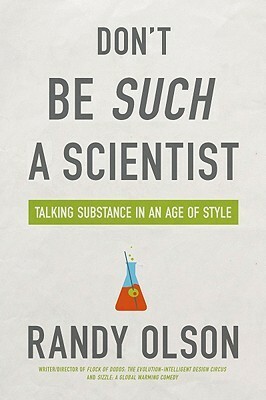 In Don’t Be Such a Scientist, he shares the secrets of talking substance in an age of style. The key, he argues, is to stay true to the facts while tapping into something more primordial, more irrational, and ultimately more human. In a book enlivened by a profane acting teacher who made Olson realize that “nobody wants to watch you think,” he offers up serious insights and poignant stories. You’ll laugh, you may cry, and as a communicator you’ll certainly learn the importance of not only knowing how to fulfill, but also how to arouse. I have an undergrad degree in a biological science so I can say that from my experience, this is largely true. A lot of our lecturers were experts in their fields and were responsible for some major advancements and discoveries…. however, they were as boring as balls to listen to and learn from. Teaching is their deal with the devil to carry on doing the research they love and it comes across that way when you’re sat in front of them with your notebook. This is all the first 45% of the book had to say. Scientists are boring and they should learn how to communicate better and stop boring people, possibly through the medium of cinema. At 45% I was overcome with the irony that this author was falling for each and every pitfall he was criticising in his book. There were too many self indulgent anecdotes, far too many words for so basic a principle and my pet hate: repetition of ‘we’ll get to that in Chapter x’ instead of getting to the point right away. The positives: the point made was spot on – science is responsible for most (if not all?) discoveries which can improve the quality of life on the planet, but it needs a little show biz to let the public and funding bodies know that they exist. The concept ‘arouse and fulfil’ rang particularly true as a mode of communication, interest your target audience and make them start asking their own questions about your topic, then satisfy their curiosity rather than jamming data down their throats. I wanted to finish this book but even skimming through the rest would have taken longer than I was prepared to spend to finish it.